"Wave 2009": Into Unknown Waters? As the 2009 "wave season" begins, cruise lines are unsure of what to expect as the world economy continues to heave into contraction, but many new ships have been delivered and more are coming and they must be employed. How will cruise lines and clients cope with the new year? What will the 2009 "wave" season, the first nine or ten weeks of the year when traditionally 40% of the year's business gets booked, be like? Here are some things to consider, for both clients and lines. One thing is for sure. While times may be uncertain for the cruise lines, there has never been better value for the cruise buyer than there is now. This is the time of year when cruise lines spend the most on advertising and distribution, wanting to maximise their bookings for the year ahead. But compared to earlier years, the 2008 wave season was a little more subdued than normal as the credit crunch had already begun. But last year, compared to this, there were some discouraging fuel surcharges that tended to make people think twice before buying. Where have they gone? Disappeared. Something positive to start the year then. The question is will the great number of bargains out there and this year's lack of fuel surcharges lead to a better 2009 wave season in today's much worse economic climate? Although wave season 2009 only begins this week one intrepid Canadian agent came out two weeks ago to say on her web page "It's almost Wave Season! 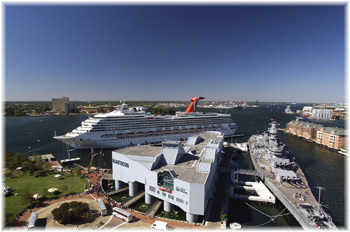 Time to book your 2009 Cruise with me!" Her first words were "My name is Lesley Newland and I am a Certified Travel Counsellor. I want to help you book your 2009 Vacation!" Well, they say you have to ask for the business! People like Lesley who sell cruises need to be alert, intuitive and adaptable and not shrink back from the bad news they see in the papers every day. While 10% could be unemployed by the end of the year, that obscures the fact that 90% will not. And even though many of the 90% may worry about their jobs, there are many who are not employed and still have good incomes and no risk of job loss ­ they are called the retired. Peter Shanks, commercial director at Carnival PLC said in "Travel Weekly" last week "It's very difficult to predict trading patterns and consumer behaviour at the best of times ­ and here we are in the very worst of times... So what lies ahead in 2009, and what should we be doing about it? Firstly, be prepared for the toughest trading conditions we have ever seen. The best way to approach this is to trade harder than ever before. There is plenty of evidence to show that those operators and retailers who are out there fighting for every sale, promoting hard and chasing down databases are still seeing the business come in." Cruising is Still the Best Value! With all the hoopla about ice-skating, surfing and wall-climbing on cruise ships, and added tariff restaurants, spas, cabanas and shopping, one simple thing has become totally obscured. That is that the cruise product is still the absolute best holiday package around. Forget all the bells and whistles and mountain bikes, what one pays for in a cruise holiday is full room and board, with all meals and entertainment while on board, plus transport from port to port ­ it's not just a hotel. Only drinks and shore excursions are extra. You don't need to indulge in all those other shipboard revenue-generating schemes that the cruise lines dream up. Who really wants to buy art at sea? Go for the free drink and forget the art! The basic cruise product has always been all-inclusive and the extra temptations can be ignored (of course, they may not be, but that's human nature). Some cruises even include the drinks and not only among the upmarket lines - probably the most interesting to do this recently is the new French product, Croisieres de France. If cruise lines really want business and want to start dipping into a whole new market they should get rid of those ridiculous 75% and even 100% single supplements that that single travellers often have to pay the same as two people if they want to travel alone. The cruise lines know all about yield management and could do two constructive things here. First of all, based on projected bookings, they could reduce supplements to say between 15% and 25% dependent on demand on some sailings. And secondly, they could start a standby scheme for single travellers with no supplement at all, so that when a sailing looks about to go out with several empty cabins they could be offered to singles (they could even do this for couples wanting to save and phone them first). The best thing about singles is that they all have friends and the best thing about cruising is that people want to return. Singles may just have to adapt a little, or bring a friend, when the economy improves again, but they are a source of revenue that should be tapped in a downturn. If you didn't know this before, you will now. The generally accepted mark-up on shore excursions is around 100%. Yes, you often pay the cruise line twice what they paid to buy your shore excursion. Okay, they have to spend some time running a shore excursions department but it you do your research properly, you could have your own private car waiting for you and a few friends to do your own thing ashore. You will either save a lot of money or get much better value for it and you will not be herded around on buses like so many sheep. But remember the old expression "caveat emptor" or buyer beware; this may not be for everyone. Now is a good time to be buying shares. 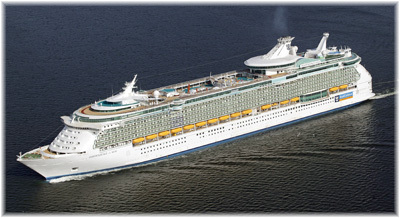 Prices are down so there are some good deals out there, even among cruise lines. The interesting thing is that if you become a shareholder you also become eligible for certain perks, depending on the cruise line, Buying 100 shares might get you $50 to $200 of on-board credit. You can always sell your shares after the cruise, and maybe even make a little money on them (consumer warning: The Cruise Examiner is not a stock tipster, so get good advice first). American cruise lines have said for some time that if Americans want to save money they should tour Europe in a dollar-denominated cruise ship where all expenses are in dollars. A year ago a Euro cost Americans $1.47. By March this was up to $1.53 and it peaked at very close to $1.60 in July. That hurt but the dollar has strengthened so that today that Euro costs an American only $1.39, or about 5% less than last year and 13% less than in July. As recently as last month it was close to $1.25 but then the dollar started dropping again. The point of this is investigate how you pay if you are paying in a different currency. On the other hand, by booking on a Sterling-denominated ship cruising in Europe, the beleaguered Brit will be able to do the same thing the beleaguered American does when their currency drops, controlling how much they spend in Euros. But remember, while your pound or dollar may have dropped, you are often buying a cruise at a price that was set before that happened, thus gaining extra value. 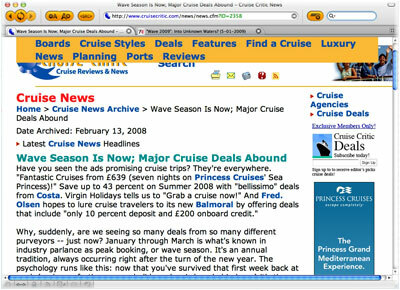 There are so many deals out there right now that it's impossible for The Cruise Examiner to begin to run them down. But more than nine of ten cruises are booked by travel agents. If it's really a cruise you want, then use a specialist. Not all travel agents have the experience, but today there are literally hundreds of cruise specialists out there who will know where to find you the right deal and put you on the right ship and not the wrong one. Membership of the Cruise Lines International Association in North America and the Leading Cruise Agents of the UK, just to take two examples, includes many agents who specialise in selling cruises and know what they are talking about. With some 300 cruise ships out there and such a diversity of product available, they will be able to cut through any confusion and give you personal advice to give you the best cruise experience ­ and in today's marketplace get you extremely good value too!